December 08, 2016, New Delhi: Dec 9th is International Anti-Corruption Day when the leading civil society organizations and countries re-commit to fight corruption. It is no hidden fact that the level of corruption in India is very high. Forbes recently named India as one of the most corrupt country in the world with Transparency International ranking it at 76 out 168 countries in its 2015 corruption perception index. While India’s ranking has only shown small improvement in the index from 85 in 2014 to 76 in 2015, per the recently conducted LocalCircles national survey on corruption, 68% citizens expect this ranking to drastically improve in the next 5 years given the use of participative governance models, social media and technology. 16% said that the reduction in corruption will only be marginal and another 16% said that there will be no reduction in corruption in India at all. The survey in which 8,681 people participated was done across 200 cities in India. While the above gives hope for the future, the current situation is grim. 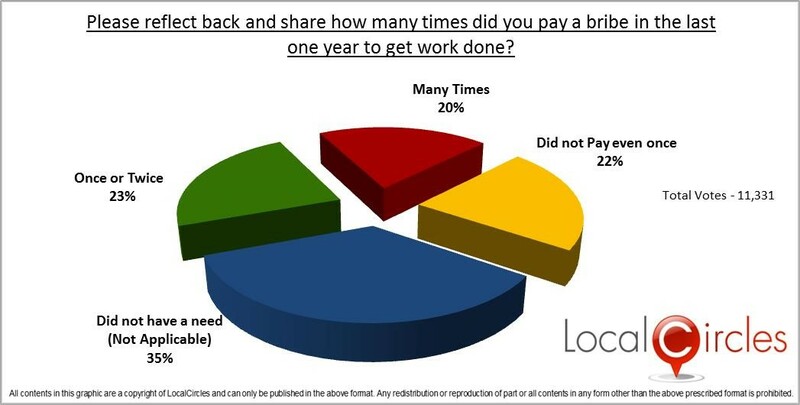 Per another question in LocalCircles survey, 4 in 10 Indians paid a bribe last year to get work done. 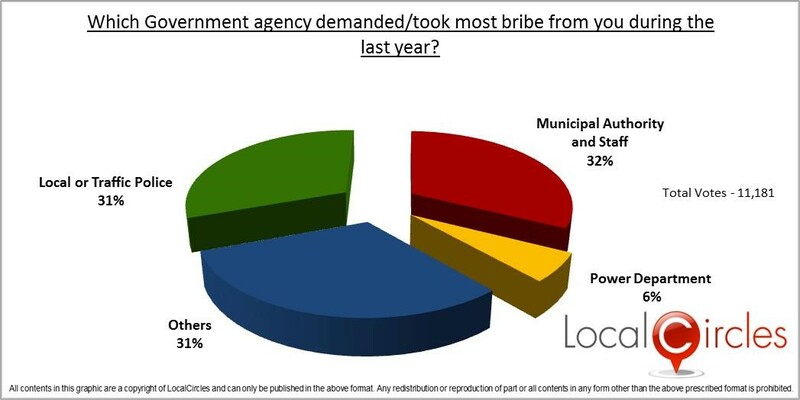 Of those who paid bribes, 32% citizens paid bribes to the Municipal Authority, 31% paid bribes to local and traffic police, 31% paid bribes for various registration and taxation related matters while only 6% paid bribes to the local electricity board or power department. 49% citizens said that there has been no reduction in corruption in the state government and local administration in the last 2 years. 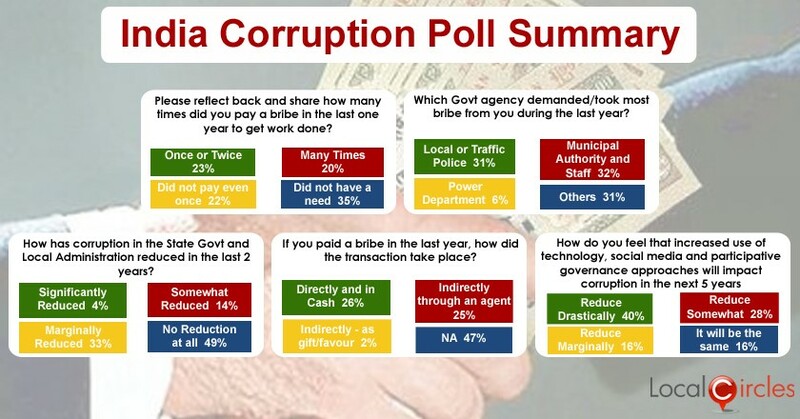 Of those who paid a bribe, 26% paid it directly and in cash, 25% paid it through an agent which indicates that cash is key when it comes to bribery. Majority citizens also believe that India’s demonetisation program which is focused on reducing black money and increasing cashless transactions will help in reducing corruption. As far as initiatives for reducing corruption go, Transparency International India and LocalCircles host India’s largest anti-corruption community with over 63,000 citizens of India where various discussions take place regularly and the collective citizen pulse is reported to the CVC and other investigation agencies for policy enhancement. 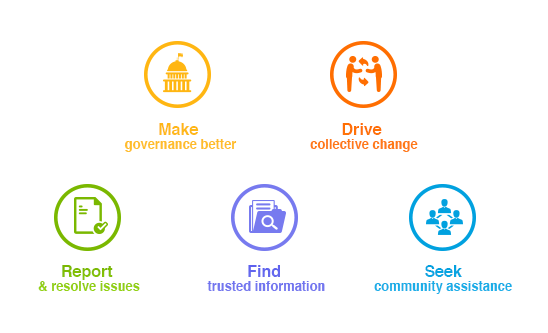 Recently state level online communities have been formed to bring citizens together and connect them with their state’s lok ayukta and anti-corruption bureaus. These communities allow anyone to go online and report a bribery transaction and get attention of the administration which has historically been hard to get.